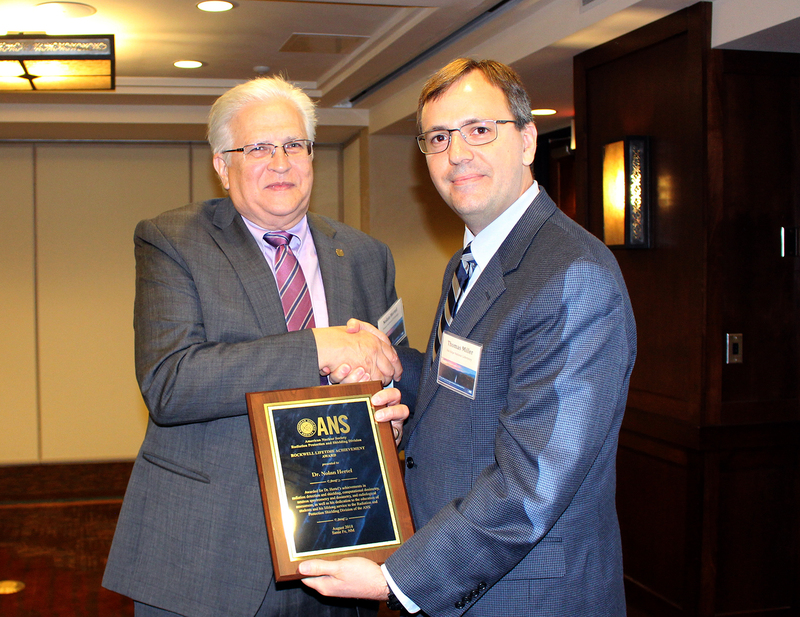 Dr. Nolan Hertel received the Rockwell Lifetime Achievement Award from the American Nuclear Society Radiation Protection and Shielding Division at its 2018 Topical meeting in Santa Fe on August 28, 2018. The Rockwell Lifetime Achievement Award is based on long-term or lifetime achievement in research, technology development, or education in the fields of radiation protection, shielding or dosimetry. It is expected that most recipients will have been long-time active members of ANS. Moreover, most recipients will be authors of publications that have made significant contributions to the art of radiation protection and shielding. Inscription on plaque: Awarded for Dr. Hertel’s achievements in radiation detection and shielding, computational dosimetry, neutron spectrometry and dosimetry, and radiological assessment, as well as his dedication to the education of students and his lifelong service to the Radiation Protection and Shielding Division of the ANS.